Landing pages allow content and site managers to create visually attractive pages by simply choosing, ordering, and configuring premade sections. Landing pages can be used in several ways: to promote a list of content created in the site, a group, an event or it can even be a static content page (like the basic page) but more visually appealing. A short explanation of the feature (read). A few videos with a detailed explanation (watch). 1. Landing pages in short. Landing pages are created using the '+' button in the header menu. For each landing page, users can configure its title, visibility, URL alias, publish status, and the sections. Hero: this section consists of a full-width image, a title, a subtitle, and two buttons. It's used to give a first impression of the site or page. The two buttons can be configured differently for people who have and have not logged in. Introduction: this section consists of a title, text area, and a link. It can be used to introduce the site or page. The link can be configured differently for people who have and have not logged in. Featured: this section is where topics, events, groups, members, basic and bookpages and other landing pages can be featured. For each section, a maximum of three items can be featured. A link can be added to each section for people to see more. Block: this section consists of two parts. In the left part, the latest activities of the community can be shown. Users can specify the number of activities that are shown. 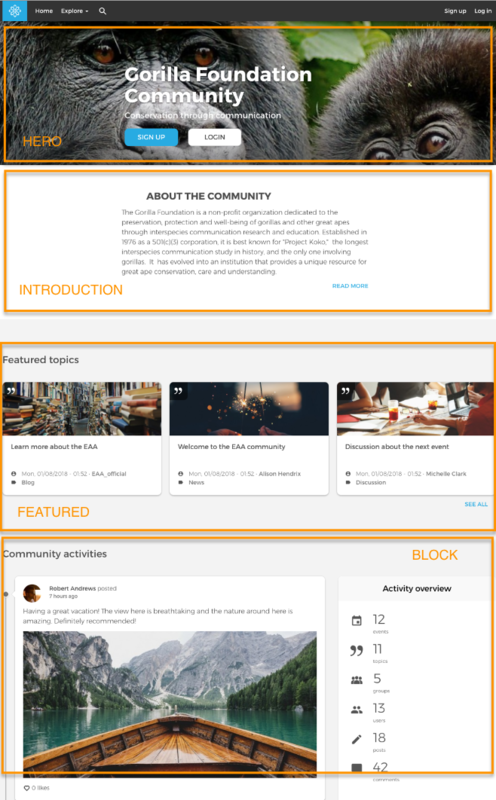 In the right part, users can choose between 4 blocks: latest topics, latest groups, latest users, or activity overview of the community. A link can also be added to the bottom of this section. 2. Instruction videos (per section). To learn how to configure the landing pages in depth, watch the videos below. Each section is explained in a separate video. In the last video (Video 5) you'll learn how to reorder sections or add a section in between other sections. It also explains how you can add a landing page as a link in your menu. N.B. These videos are still in the ‘experimental’ phase. This means there’s been no editing, non-native English is used, and the videos are not at the level of professionalism that we aim for - please be kind! These will improve over time.